Lancia will be present at the Frankfurt Motor Show, this week, in shades of black and white. The display area has been designed to embrace the public, offering them over 900 m2 in which to view the latest automotive novelties and experience the brand that is dreaming that it may return to Australia. The stand will feature the new Lancia Musa (see opposite) which makes its first public appearance at an international motor show, although it has been previewed in Italy. Two Musa Platinos are on display with two different engines, the 1.9 Multijet and the 1.3 Multijet with DPF. The first version has Masaccio Black paintwork with leather and Alcantara Starlite upholstery, while the second features a two-tone body (Peyrano and Rouge) combined with Chocolate upholstery in leather and Alcantara Starlite. Both cars are lavishly equipped: in the safety field, for example, they feature an ESP system, 6 airbags, foglights, the Blue&Me® system and TPMS (Tyre Pressure Monitoring System); where comfort is concerned, they are offered with automatic dual-zone climate control, cruise control, satellite navigation, parking sensors, radio controls on the steering wheel and electrical rear windows. And finally, the two new Musa Platino sport 16” alloys, a leather-covered steering wheel and gear lever knob with contrasting stitching and the GranLuce sunroof. The display is completed by a car equipped with the 1.4 16v engine, with a DFN (‘Dolce Far Niente’) robotised gearbox in the Oro specification and the following safety features: 6 airbags, ESP, TPMS, foglights and the Blue&Me® system. The attention paid to occupant comfort is underlined by the dual-zone automatic climate system, cruise control, a radio with CD and MP3 file player, parking sensors, radio controls on the steering wheel and electric rear side windows. And that is not all: Airtex fabric also offers excellent transpiration. The 16” alloys, leather-covered steering wheel with contrasting stitching and two-tone body (Masaccio Black and Botticelli Grey) complete the model’s livery. There is also space for the little Lancia Ypsilon Sport MomoDesign, the version that was the fruit of collaboration between Lancia and MomoDesign, two Italian industrial concerns that are known in some circles throughout the world, now united by innovation in design, the use of cutting-edge materials and attention to detail. There will be two examples of the Ypsilon Sport MomoDesign on the catwalk in Germany, one powered by the 1.4 16v engine and the other by the 1.3 Multijet. Both have two-tone paintwork, which has been a feature of Lancia and is now the result of a long, complex painting process. One combines an opaque Titanium grey roof with a Casorati Yellow body, while the body of the second car is Masaccio Black. In addition to the two-tone livery, the two Ypsilon Sport MomoDesign cars mount a wide range of standard and optional equipment: automatic dual zone climate control, a radio with a CD and MP3 file player, the Blue&Me® system and foglights. stand is completed by the Lancia Thesis and Lancia Phedra. Visitors will be able to see a show car that is derived from the latest version of the Thesis, and a 7-seater version of the Phedra Emblema, powered by the new 2.2 Multijet engine. This engine incorporates a double sequential-parallel turboblower, thanks to which response times are limited even at low speeds, a factor which enhances elasticity, entertainment and performance. With peak torque of 370 Nm available at 1,500 rpm, the car accelerates from 0 to 100 km/h in some 10.8 seconds (compared to long 12.5 second for the 2.0 Multijet version). Pick-up from 80 to 120 km/h in 5th is 11 seconds (0.7 seconds faster than the 2.0 version). Top speed is 200 km/h and consumption is also identical to that of the 2.0 litre version. Overall, this outstanding performance means high cruising speeds, good acceleration and pick-up, but low consumption. The show car derived from the Lancia Thesis Sport has two-tone bodywork (Maserati Quartz Dolomite, tone-on-tone) that sets off the lines of the model. The design of the 18” spoked alloys adds an extra touch of elegance, with a nuance that matches the colour of the roof. The same is evident in the interior, thanks to the new Frau® Beige leather upholstery with coordinated black finishing elements and black ebony wood inserts. It is powered by the 2.4 Multijet 20v engine with a five speed self-adaptive sequential automatic transmission. What is more, with this equipment, the car has a top speed of 222 km/h and accelerates from 0 to 100 km/h in 9.7 seconds. The public in Frankfurt will learn all about the concept of the Lancia Cafés, which are being opened all over Europe, where people can meet and enter the ‘Lancia world’, interfacing with the worldwide network of Lancia Cafés, to understand and appreciate every aspect of the historical values, modernity and future of the brand. The same spirit will animate the showrooms to be built in the coming years and the stands at the various international shows, like the one prepared for the 62nd Frankfurt Show. In fact, the stand is inspired by the concept of the Lancia Café, which is evident in the high quality level, where every detail is in line with the temperament and quality of Lancia cars. Even the furnishings and materials of the stand reflect the refinement and craftsmanship of the interiors of all Lancia models. The whole effect is set off by architectural elements that provide the effect of a deconstructed, filtered, dynamic space: an environment that is not perpendicular or conventional, in line with the unique nature of Lancia design. The concept of the Lancia Cafés has also given rise to the Lancia Boutique, an environment where people can inspect the accessories and clothing with the brand logo. The Frankfurt Motor Show stand is therefore a shop-window onto the brand, with the relaxed atmosphere of a lounge. In this display, Lancia confirms the vitality of a brand which for a century has managed to maintain its identity as the maker of cars that has witnessed mixed fortunes. And the brand intends to tackle the coming years with the same spirit and goals, constantly proposing new products. 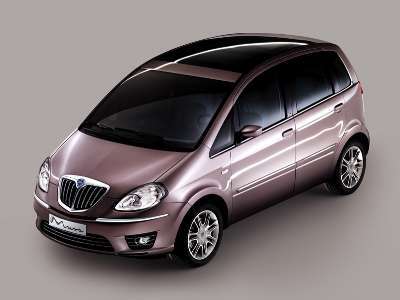 Suffice it to say that 2006 saw not only the debut of the new Ypsilon, but also that of the new Delta HPE, which will be marketed in 2008. And now the new Musa faces 2007. But other novelties are in the pipeline. Lancia has set itself the goal of reaching the milestone of 300,000 registrations a year by 2010. With these guidelines, it aims to consolidate its position on the Italian market and to grasp the prospects on the major European markets, also targeting new markets like Russia, Turkey and Scandinavia and, amazingly, returning to right-hand drive markets in Europe and further afield. Markets such as the United Kingdom, Ireland, Malta, Cyprus, Japan, Australia and South Africa.